We crossed another Rally Rubicon this morning when we boarded the George Black ferry to take us across the Yukon River. Wide, deep and fast flowing the power of the water forced the ferry to trace a long sweeping arc across the gorge and like countless bounty hunters before us we pressed on in search of our very own El Dorado. Once up and out of the cutting the views from the other side let us see how important the river was to the town as it sits between Klondike and Yukon. Before the roads came to the area, river travel was the only way. So, how did the day pan out? This was the final day with Time Trials, one in Canada one in the USA. Both sections on twisty gravel that swoops and rises over blind crests... By now most crews are getting the hang of this but the day was to prove something of a game-changer. The Jaguar crew of Richard Worts and Nicola Shackleton still holds the lead, but the battle for second overall became intense, the Leyland P76 of Gerry Crown and Matt Bryson ended the day on exactly the same penalty total as the Jaguar E-Type pairing of Phil Garratt and Kieron Brown, who put in a good effort all day to close the gap on the Australians. 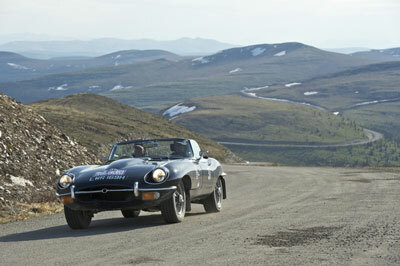 The border itself was uneventful, no Canada out control only a USA in and the Rally sailed through with no fuss at all. 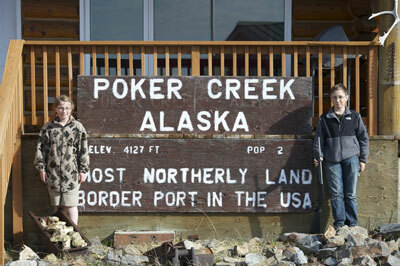 A house at the Poker Creek border post proudly proclaimed its status with population of just two, and an elevation of 4127 ft. We would have drawn quite a crowd if there'd been anyone else available. Straight after the border was test 2, long and gravelly - what else. We were in Forty Mile River Country "the land shaped by the power of running water" and we made our way gently towards the river bottom and along the creek passing the mine workings along the way. The lunch in the three-hut village of Chicken was fantastic. This is a legendary old staging post but now a destination in its own right as the two tour buses parked up proved. The cafe had buffalo chilli, fruit tarts and good coffee. Just the stuff to refuel a hungry rally. In the next door gift shop the sheer volume of fowl related miscellany was staggering. From the fridge magnets bearing inscription I got laid in chicken to the Chicken key fobs and T-shirts it had to be seen to be believed. Sue, the proprietor remembered our Round the World Rally coming through town 12 years ago and she was pleased to see us again. A bar lined with hats and underwear completed the madness that is the town of Chicken. Everyone enjoyed this stopover and many said that if they're ever in the area again they'd most certainly drop in again. But it was on to Fairbanks after lunch and we still had some miles left to crunch through the Alaskan wilderness on a very good tarmac highway. The great snowy Wrangell mountain range lay ahead of us in the distance. We crossed the Robertson River only half full of ice, great thick chunks of it like icebergs pouring meltwater into the murky brown ferment. On the run in to Fairbanks we passed the Eielson airforce base as first a transport plane then a fighter took off as another two landed. There's a NATO exercise happening at the moment but it's a bit 'hush hush' if you know what I mean. Needless to say we heeded the signs prohibiting stopping, slowing or photographing. Tomorrow is a rest day. Then one more session takes us to Anchorage and the prize giving.